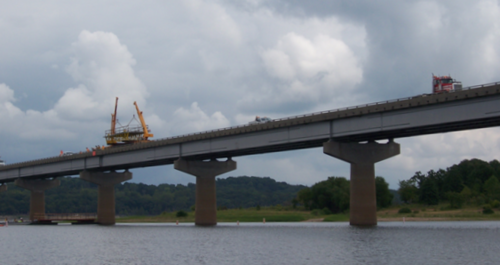 The purpose of this article is to determine whether temporary navigational control that may affect safety and navigation on Missouri waterways is needed for bridge construction projects or other worksite related projects. For the purpose of this article, a navigational hazard is considered any reasonable danger for potential boaters created by the placement of construction equipment, activities or other obstructions placed on, adjacent to or above Missouri’s navigable lakes, rivers or streams. The Mississippi and Missouri Rivers fall under the jurisdiction of the U.S. Army Corps of Engineers and U.S. Coast Guard. Permits for these projects are typically handled by the Bridge Division. Although most of Missouri’s lakes, rivers or streams could be considered navigable at some point or another, the size and water level limits the possibility of navigational traffic. For smaller rivers and streams, contact the Missouri State Water Patrol to determinate the need for navigation control. Privately owned bodies of water, or bodies of water owned by local municipalities or other political subdivisions, would not fall within the Missouri State Water Patrol’s jurisdiction, as the permitting agency, unless the shoreline of the waterway exceeds four miles. 1. New construction or deck replacement requiring work barges or pads on the water requires navigational traffic signing and devices on Missouri major rivers and lakes. 2. Rehabilitation or painting under an existing structure without the use of a work barge on the water usually requires navigational traffic signing and devices on Missouri major rivers and lakes. 3. Rehabilitation or painting on or above elevation of the bridge deck typically does not require any navigational traffic signing and devices on Missouri major rivers and lakes unless there is a risk of overspray or debris falling. 4. Temporary closures of the waterway. The Missouri State Water Patrol, U.S. Coast Guard or the U.S. Army Corps of Engineers must provide final approval for all navigational matters. The work zone is composed of three basics components: The advance warning area, no wake area and the work area. In the advance warning area, the boaters are informed of what to expect. The advance warning area contains warning signs with appropriate message and warning lights. The sign or signs shall be positioned prior to the first line of warning buoys. In some cases on high volume waterways the warning sign shall include arrows directing the boaters to open passage lanes. When the work requires a work boat or barge, a line of “No Wake” buoys will be placed outside of the “Boats Keep Out" buoys. The intent of these buoys is to reduce boat wakes causing movement of the work barge. This line of buoys may extend across both sides the entire structure or circle just the “Boats Keep Out" buoys. All buoys may have warning lights. Once the size of the work area is determined, a string of “Boats Keep Out" buoys spaced every 100 ft. to outline the work area. All buoys shall have warning lights. 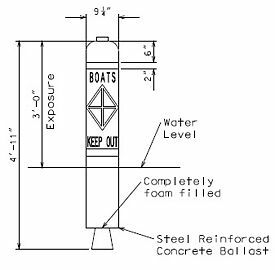 These buoys are required for any work under the structure or when there is a risk construction debris or paint falling. The area where the work boat or barge parks against the shore or bank is marked the same as the work area. Except for the Mississippi and Missouri Rivers, navigational work zone plans and estimates should be developed for structure crossing a lake or river. The cost of installing, maintenance and removal of these devices can be a significant project cost. The proposed navigational plans should be submitted as a pdf file to Missouri State Water Patrol for their review and comment. The final navigational plan shall be included in the traffic control plans and bid items as a guideline for bidding purposes. It shall be the responsibility of the contractor to apply for and acquire all permits from the authority having jurisdiction on the body of water. The final navigational plan will be based on the contractor’s equipment and schedule as approved by the proper authority. This page was last modified on 29 January 2019, at 09:34.